After visiting Bonn for the DW Global Media Forum, I spent two days in Berlin with my friends. It had been almost exactly two years since I last saw them. It was a little bit like being back home. I went back to the student housing unit I had lived in for a year and, suddenly, I stepped back into the conversations we used to have. I have missed them dearly. My friends stayed at the ECLA, and they are now moving into the fourth year of the BA program, in which they have to work on a project for a full year. Vira told me she is going to do her project on an artist who takes on the relationship between the capitalist market and art. We had good conversations about the creative process and the struggles we both have when facing it. I was so very happy to see my friend David, as well. 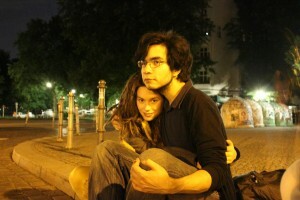 He is Mexican, so, as the other Latin American student at ECLA, the two of us became very close. Since I have been back in Argentina, he has been working very hard on his German, taking lessons at the Freie Universität, sometimes making presentations, and also writing essays in German. Dana also told me about her project and what she expects to do afterwards. She said she was definitely going on for an MA. As we talked, I realized this is the kind of conversation I missed: filled with reflections and the ins and outs of academic life. In the rush of the everyday working world with putting in your time in the office and everything else, this approach to conversation is quite rare indeed. Right after travelling to Germany, I told my parents how I wanted to go back to university and study something else. I feel like I haven’t done it for some time, and I miss the challenge of it. As I think back on all of this now, an idea occurs to me: Education – or, better, learning – is an attitude towards life. Accepting the challenge can take you far. The big question is how to make accepting this challenge possible for everyone. That means finding ways for many students to avoid frustration, perhaps by adopting a teaching model that does not rely on model students, but, rather, that is open to everyone alike.